There is Taco Tuesday… and then… there’s Pizza Thursday?!? Not sure that’s really a thing, but today we are making it a thing. It’s pizza time!! Extra special, extra colorful pizza!! YESS. My favorite kind… well, actually extra cheesy pizza is my favorite kind, but colorful is a close second! SO I have to make this quick today because little Ms. Asher is back from Korea and she is already chatting my ear off about one, how bored she was there, and two, how much she missed me, and three, how much she LOVES Harry Potter. I’m telling you guys, I’ve created a little Harry Potter monster, and I couldn’t be more pleased! 🙂 Asher is now on winter break (pretty nice the way that worked out for her, 7 days off of school and then 3 extras days for break!). Since her make up work has long since been completed, she’s got a lot of free time on her hands…yikes. Anyway, little sis is currently sitting next to me (in the very same seat) playing with the filters on my snapchat while she waits for me to finish this post…the pressure is on. Speaking of Korea though, my parents brought me back the coolest new dishes. YEAHHH! I am so excited! Unfortunately, you guys probably will not be seeing them for a while, as I am currently stockpiling new props for cookbook photo shoots. 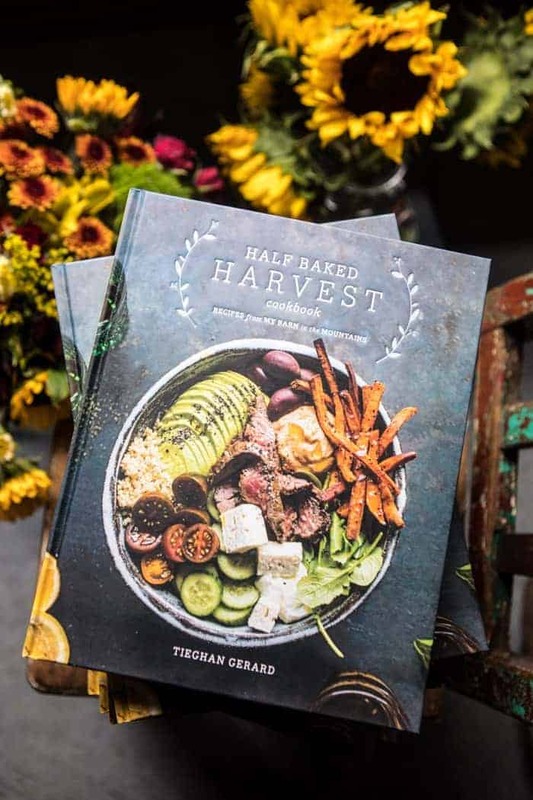 Oh the cookbook, exciting things are happening behind the scenes, but man it’s really starting to take over my life! I’m currently writing and editing recipes like it’s my job. 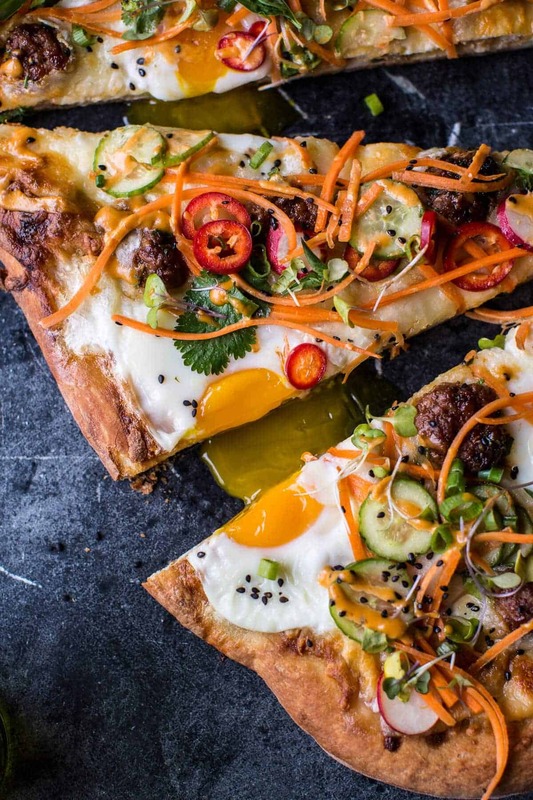 Okay, but let’s talk Banh Mi Pizza before Asher kills me. I know this pizza is a little different. I mean, for one, the eggs, two, there’s a lot of color happening on top for a pizza, but hear me out. Have you ever had a Vietnamese Banh Mi sandwich? If you haven’t, I highly recommend, no demand, that you change that ASAP. Seriously, a Banh Mi is possibly one of the most delicious sandwiches around. They are compiled of pork, pickled veggies, spicy sauce and sometimes (in my case all the time) a fried egg. It sounds simple, but I promise it’s one killer sandwich, and you guys have got to try it…. Or just try the pizza version! Both are equally delicious. One of my favorite things to do with pizza is to top it with salad fixings once it comes out of the oven. I know, all you cheese pizza purists out there are eyeing me down right now, but it’s just what I like. 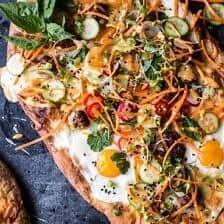 So a Banh Mi Pizza was a no brainer for me. I happen to have a batch of fresh Naan dough sitting in the fridge so I decided to use it as pizza dough. Well it turns out that using naan as pizza dough is THE BEST. 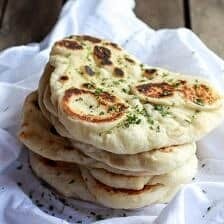 You can obviously just use pizza dough, BUT I highly encourage you to give the naan a try. It’s kind of awesome when made as a pizza. 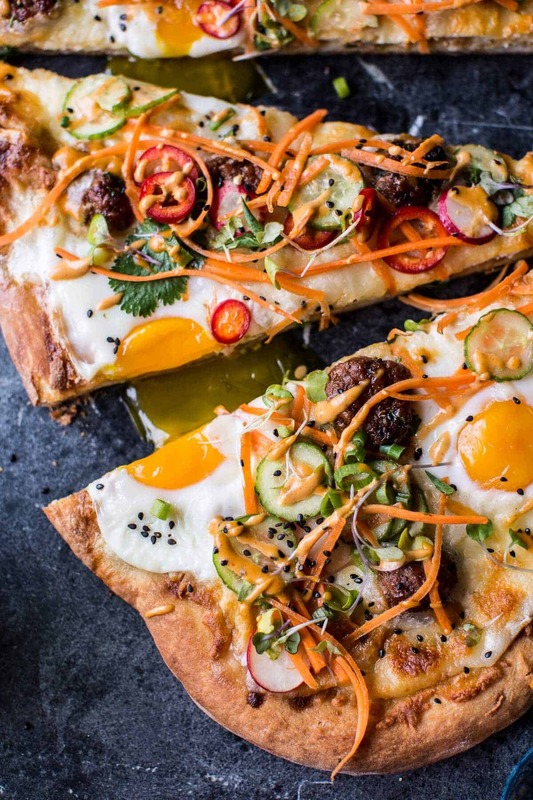 Once I had my dough situation all worked out, I topped it with a little “banh mi” sauce, added some fresh mozzarella cheese (not traditional on a banh mi, but a must for any pizza), topped that with some Vietnamese pork meatballs and yes… eggs. Nothing better than eggs on a pizza guys. I then I tossed together a simple salad full of all the banh mi classics: carrots, radishes, cucumbers, cilantro, green onions and a little Thai basil. I also made a spicy sriracha “mayo” out of tahini. I’m personally not a huge fan of mayo, so I like to come up with fun ingredients to replace the mayo with. Tahini is my go-to and I will not lie, this tahini “mayo” is EVERYTHING. I know this pizza is a little different. I mean, for one, the eggs, two, there's a lot of color happening on top for a pizza, but hear me out. Prepare your dough or naan and make sure it is warm and at room temperature. In a small bowl, whisk together the soy sauce, sesame oil, honey, fish sauce, sriracha, lime juice and lemongrass. 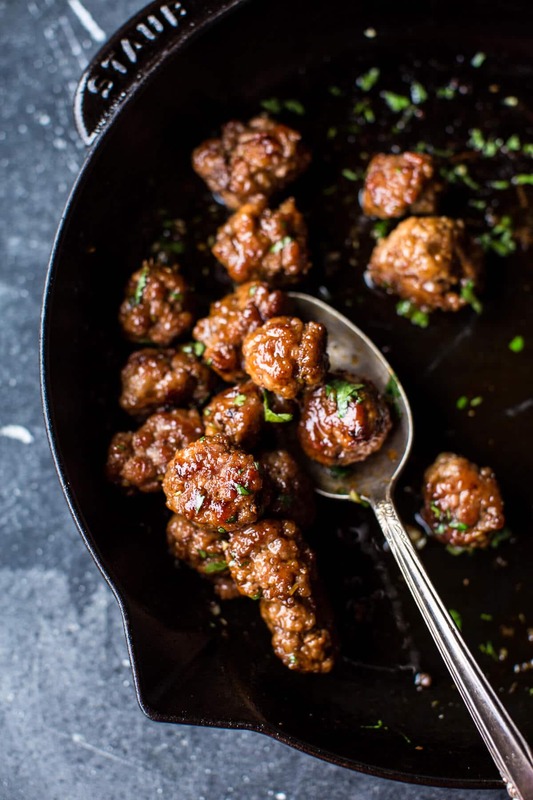 Season the pork with salt and pepper and then roll into 10-15 meatballs, place each meatball on a tray as you work. Heat a large skillet over medium heat and cook the meatballs until cooked through, about 5 minutes, turning them 2-3 times throughout cooking. During the last minute or so of cooking, add about 1/4 cup of soy sauce mixture and give the meatballs a good toss through the sauce. Cook another minute longer until the sauce glazes the meatballs. Remove from the heat. Brush the soy sauce mixture over the dough, leaving any leftovers for serving. Add the mozzarella cheese and cooked meatballs. Now crack the eggs over the cheese, sprinkle with salt and pepper...and maybe a little more cheese (you know I would!). Bake 25-30 minutes or until the cheese is melted and the egg has cooked to your liking. Meanwhile, combine the carrots, cucumber, radishes, green onions, chile pepper, cilantro and basil in a bowl. Toss with sesame or peanut oil. Set aside until the pizza is ready. 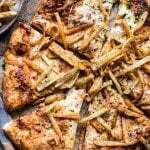 Once the pizza has cooked, remove from the oven and top with the fresh veggies. Sprinkle with sesame seeds and drizzle with the sriracha "mayo" (recipe below). slice and EAT! 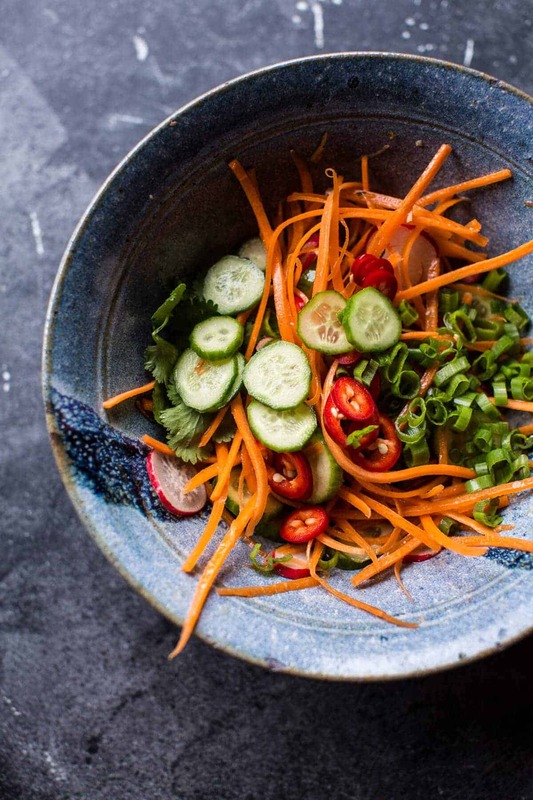 In a bowl, whisk together the tahini, sriracha and lime juce. Add water until the sauce is runny enough to drizzle over the pizza. Taste and adjust seasonings as needed. Sauce will keep for at least 2 weeks in the fridge. *Alternately you may use real mayo in place of the tahini. Now let’s all eat pizza! Done and DONE. P.S. Don’t forget, you can vote once a day through March 7th for your favorite food blogger!! Just click on the badge above to link you to the Better Homes & Gardens site to vote! THANK YOU for all your continuous support! 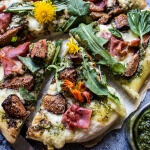 Dandelion Green Pesto, Fresh Fig and Gorgonzola Pizza with Prosciutto. love how fresh this sounds! and that runny egg- especially when you have all that naan to sop it up with! Gimme a slice!! Actually, forget the slice and gimme the whole thing!! Thank you so much, Miranda!! Oh no you DIDN’T! This is so awesome! 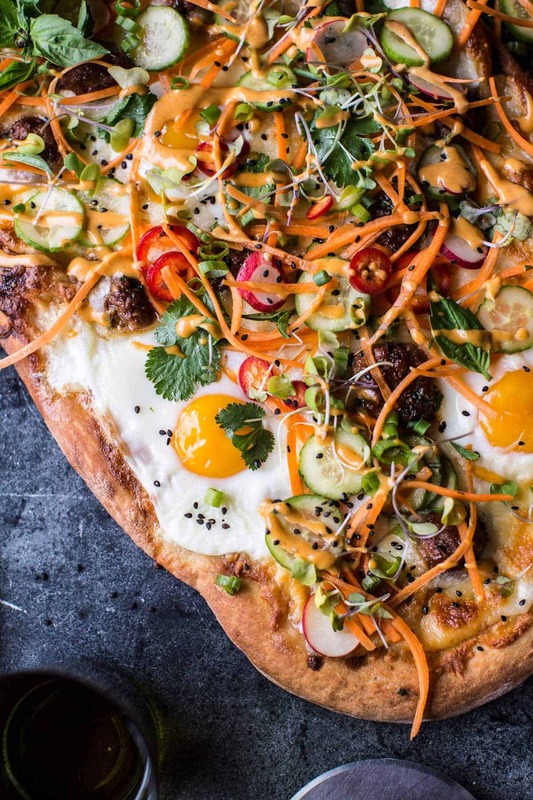 We made a meatball banh mi sandwich the other day and it was literally one of the best sandwiches I’ve ever had, but that on a pizza is just – I just can’t!! This goes straight onto our list! Thanks for the idea! OMW !!! this is to die for….. I could so do with this now !!! 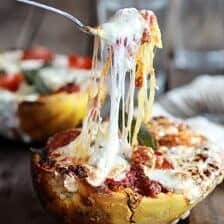 Count me in for Pizza Thursday Tieghan! This pie looks amazing! Congrats on being nominated at BHG!! Yay! Counldn’t think of a better blog to get nominated! Oh, this looks so delicious!. Two questions: Where does the honey go in the recipe? I am thinking that it is a part of the soy sauce, sesame oil, fish sauce, sriracha, lime juice and lemongrass mixture but did not see it mentioned in the Instructions. Also, I thought that the traditional Vietnamese veggies calls for pickled veggies. Does that get taken care of with all the other ingredients and it is not necessary to pickle the veggies? I actually like this idea because there are already a wealth of flavor notes involved in this great recipe! Sorry, I fixed the recipe to read correctly. Honey is apart of the sauce like you thought. Yes, traditionally the veggies are pickled, but I wanted them to be a little fresher, so I just tossed them with a little peanut oil. Hope you love the pizza! Thank you!! Thank you so much, Natasha! Hope you are having a great week! I’m so ready to fire up the grill for this pizza. Perfection! 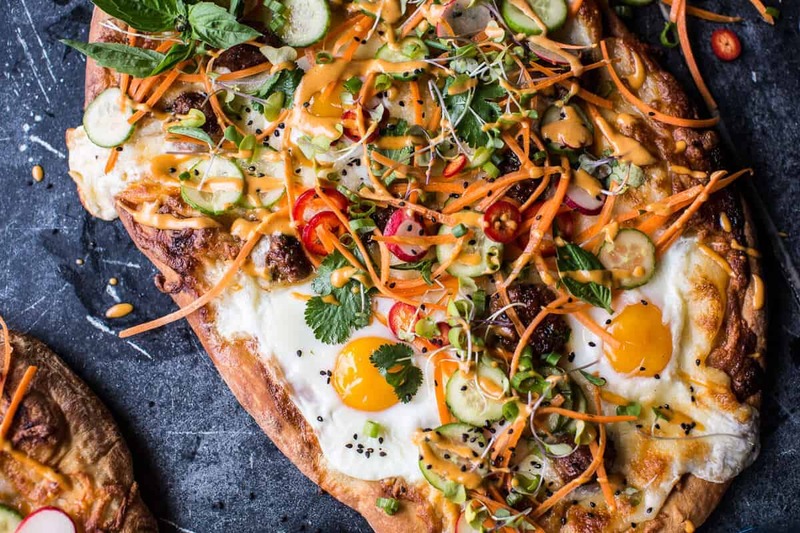 This looks incredible, love the idea of the sriracha mayo! 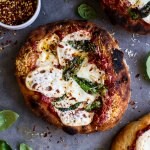 I am so on board with this idea of Pizza Thursday!!! 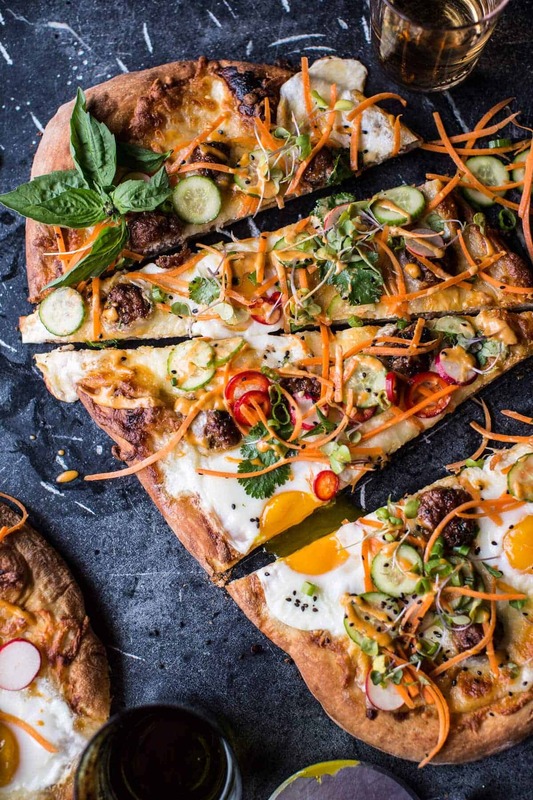 um, I am SO down for pizza Thursdays if I get to eat this pizza. so fun that your parents and Asher got to go to Korea!! haha! Thank you so much! Hope you are having a great week! Oh my god, Teighan! This looks so amazing. 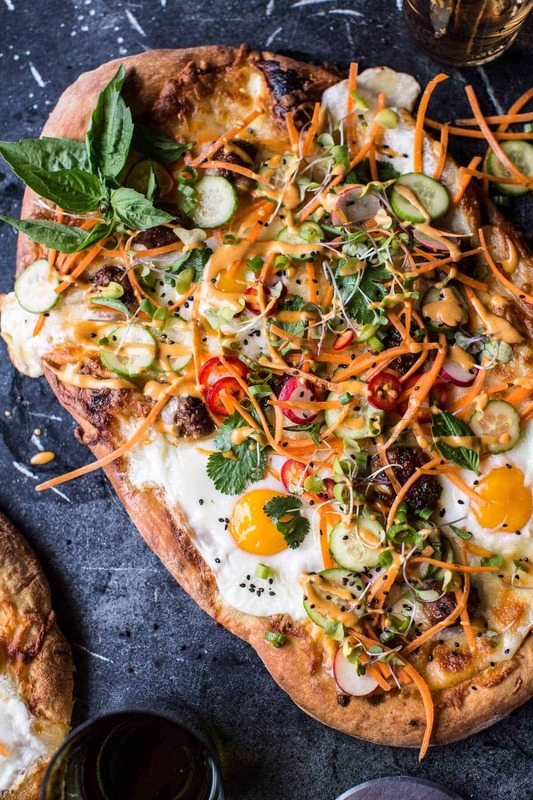 I would never have thought to use the ingredients of banh mi to make pizza. Can’t wait to give it a try! 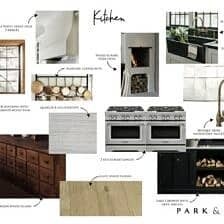 Girl I am always amazed at how you are able to do so many amazing recipes for blog along with cookbook!!! You are awesome!! 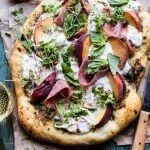 This pizza looks so gorgeous! Seriously, how are you putting out so much good food and a book. I can hardly do two posts a week with developing, testing and writing recipes for my book. I’m in serious awe!!! You go! Can’t wait to see what the cookbook holds! Just curious but is there a date for the book yet?? Was it this year or 2017? HI! Is is going to be out fall of 2017. Thank you! What a colourful looking pizza! I love eggs on pizza too. I cannot wait to make this! My Goodnesss this looks sensational…I would have it without fish sauce and meat (being a vegetarian) but doesn’t look like those two ingredients would detract from this fabulous dish. Excellent photos. 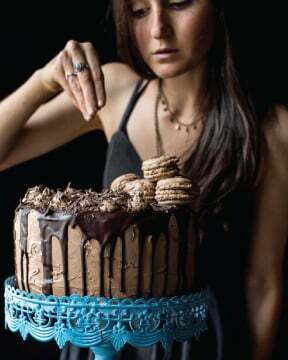 Hi there, just wondering what temperature to bake this lovely creation at! Thank you!! Ping on this – what is the baking temperature? Thanks! Oops, sorry! 425 degrees F. Let me know if you have any other questions. Thanks!! Wow. This pizza is, conceptually, incredible. We tried it out tonight and loved it, with just a few questions. Does the first 2/3 cup of herbs get whisked into the sauce? What temperature do you recommend for cooking? Scallions are pictured but not listed? Finally I’d recommend reducing the sauce, it was far too thin and leaked off the pizza left and right. The sauce that I glazed the meatballs with was of ideal texture and flavor after thickening. 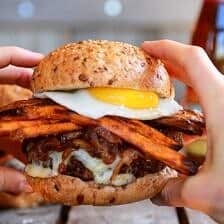 This looks amazing and I’ll be trying it tonight but I’m worried about an egg cooking for 20 minutes in a 425 oven. Will it still be runny? HI!! It depends on the size of your eggs. Mine where still slightly runny, but if you are concerned, I would just add them more towards the end of cooking, maybe with 15 minutes to go. Let me know if you have questions, thanks! ? Made this for dinner last night, and it was a huge success! First, in the ingredients list for the meatball you mention chopped basil and cilantro, but in the instruction there’s not a step including basil and/or cilantro? Anyways, when I make pizza, there’s one pizza(ground beef seasoned with smoked paprika, topped with sliced tomatoes, eggs and cheese) that I always make, because my little sister loves it, and complains if I don’t make it(or make it with not enough paprika). So last night I took a risk and made this pizza instead, and she said that it was almost as good as her favorite pizza! That is like the biggest compliment you can get from her when it comes to pizza. Trust me, I have tried a lot of different kinds of pizza without success. Does the pizza dough (or naan) get laid out raw then cook in the oven? Or do you cook the naan first? HI! I like to lay the naan or dough out before baking. Let me know if you have questions. Thank you! Wow!!! Made this last weekend for a lunch, & huge hit!!! Really great flavors & different!!!! Thank you for a great recipe!!! Green onions is NOT listed in the ingredient portion. Sorry about that Julianna! I will add it in! Thank you for letting me know!